Mycobacterium avium is a facultative intracellular pathogen cleared rapidly via intact host defense mechanisms. In the absence of adequate T cell function, as occurs in HIV-1-induced immunodeficiency, M. avium becomes an opportunistic infection with uncontrolled replication and reinfection of macrophage hosts. How M. avium infects, survives, and replicates in macrophages without signaling an effective microbicidal counterattack is unresolved. To address whether M. avium signals the expression of molecules, which influence mycobacterial survival or clearance, human monocyte-derived macrophage cultures were exposed to M. avium. Within minutes, M. avium, or its cell wall lipoarabinomannan, binds to the adherent macrophages and induces a spectrum of gene expression. In this innate response, the most abundant genes detected within 2 h by cDNA expression array involved proinflammatory chemokines, cytokines including TNF-α and IL-1, and adhesion molecules. Associated with this rapid initial up-regulation of recruitment and amplification molecules was enhanced expression of transcription factors and signaling molecules. By 24 h, this proinflammatory response subsided, and after 4 days, when some bacteria were being degraded, others escaped destruction to replicate within intracellular vacuoles. Under these conditions, inducible NO synthase was not up-regulated and increased transferrin receptors may facilitate iron-dependent mycobacterial growth. Sustained adhesion molecule and chemokine expression along with the formation of multinucleated giant cells appeared consistent with in vivo events. Thus, in the absence of T lymphocyte mediators, macrophages are insufficiently microbicidal and provide a nonhostile environment in which mycobacteria not only survive and replicate, but continue to promote recruitment of new macrophages to perpetuate the infection. Mycobacterium avium is an environmental microorganism which also exists in multiple hosts, including humans. Typically nonpathogenic and readily cleared via innate and adaptive host defense pathways, M. avium can invade and replicate in immunocompromised hosts with impunity. M. avium complex (MAC)2 prevalence increased dramatically with the emergence of HIV-1-induced immunodeficiency (1, 2), becoming a common opportunistic infection. In a cyclic fashion, M. avium also enhances permissiveness for HIV-1 infection (3, 4, 5, 6). With the advent of highly active antiretroviral therapies and restoration of CD4+ T cell levels, MAC incidence continues to decline (7, 8, 9). However, highly active antiretroviral therapy is not universally available nor always successful, and reports of MAC infection in non-HIV-1 infected individuals, although rare, are increasing (10). HIV-1-immunocompromised individuals may acquire M. avium through the intestinal tract where it translocates across the mucosa to enter submucosal macrophages in the lamina propria (11, 12). From the mucosa, dissemination may then occur to a variety of susceptible tissues. In HIV-1-negative individuals, susceptibility to pulmonary infections often occurs in the context of predisposing lung conditions (10, 13). MAC has been shown to present as pulmonary infections in immunocompetent patients including elderly women and smokers, as well as immunocompromised individuals who have undergone organ transplantation or with inheritable defects in IFN-γ (10, 14). Cutaneous manifestations of MAC in immunocompetent individuals also occur, especially in children (15, 16). All of these manifestations of MAC have in common infiltration by mononuclear cells and granuloma formation. Although enhanced susceptibility to M. avium infection generally reflects reduced T cell numbers and/or functional deficiencies, it is the macrophage that represents the primary host. The interaction between M. avium and macrophages, initiated via cell surface receptors, results in subsequent internalization and residence as an intracellular pathogen. The evidence that multiple macrophage receptors may be involved in the initial bacterium-host cell encounter (17), including complement receptors, vitronectin receptors, CD14, mannose receptors, CD43, and Toll-like receptors (TLR) (13, 18, 19, 20, 21, 22, 23), underscores the need for M. avium to be internalized to survive. Once within the macrophage, this facultative intracellular pathogen must commandeer the host cell machinery to enable its own multiplication and survival. However, the mechanisms by which this is accomplished are largely unknown. Whereas only a few mycobacteria may initiate the infection, over time, enormous numbers of microorganisms may be found locally or at dissemination sites as a consequence of intracellular replication and reinfection in susceptible macrophages. Little is known regarding how macrophages either kill M. avium or become its breeding ground. For example, controversy exists over whether reactive oxygen or nitrogen intermediates are toxic to M. avium (24, 25), although inducible NO synthase (iNOS) is considered essential in defense against experimental Mycobacterium tuberculosis (26). However, many of these studies have been performed using rodent macrophages or cell lines which do not necessarily parallel human macrophage responses to mycobacteria. To explore the mechanisms whereby M. avium enters macrophages and takes up residence in the absence of molecular signals derived from T lymphocytes, notably IFN-γ, we have infected human peripheral blood monocyte-derived macrophages with M. avium in vitro, and evaluated host cell gene expression by cDNA expression arrays from 2 h to 7 days postinfection. Multiple genes encoding transcription factors, signal transduction molecules, and proteins involved in regulation of inflammatory and immune responses were differentially expressed. The immediate early response was consistent with immune activation, but this response was reversed once the mycobacteria were safely internalized. By comparing intact mycobacteria, M. avium Ag, and purified cell wall lipoarabinomannan (LAM), a TLR2 agonist (23), we identify a complex profile of overlapping gene expression, reflecting involvement of a TLR2 signal cascade. Tissue biopsies were obtained with consent from HIV-1-seropositive patients with MAC and from HIV-1-seronegative donors and processed as described (3, 4). M. avium was visualized following staining with acid-fast New Fuchsin (Sigma-Aldrich, St. Louis, MO) (3). Glutaraldehyde-fixed tissues or cells were postfixed in OsO4, dehydrated through graded ethanol and propylene oxide, embedded in Spurr’s epoxy, and thick- and thin-sectioned. Thin sections were placed on copper grids, stained with uranyl acetate and lead citrate, and viewed in a Zeiss EM10 microscope (LEO electron microscope; Oberkochen, Germany) (3). Human peripheral blood cells were obtained by leukapheresis of normal volunteers at the Department of Transfusion Medicine (National Institutes of Health, Bethesda, MD), diluted in endotoxin-free PBS without Ca2+ and Mg2+ (BioWhittaker, Walkersville, MD) and density-sedimented on lymphocyte separation medium (LSM; ICN Pharmaceuticals, Aurora, OH). The monocytes in the mononuclear cell layer were purified as described (4), suspended in DMEM (BioWhittaker) with 2 mM l-glutamine and 10 μg/ml gentamicin (complete medium), and plated in 6-well (6 × 106 cells/well) or 48-well (1.5 × 106 cells/well) plates (Corning, Cambridge, MA). After an initial adherence for 4–6 h at 37°C in 5% CO2, 10% human AB− serum (Department of Transfusion Medicine) was added to the culture medium. Cells were cultured 7 days to enable differentiation into macrophages. Adherent macrophages were infected with viable M. avium at a ratio of 5:1 for 2 h at 37°C (4). The M. avium is a virulent smooth transparent strain passaged in immune-deficient animals to maintain virulence (27). Unbound bacteria were removed by washing the cells three times with PBS and refeeding with complete medium containing 10% FCS. Control populations of adherent macrophages were mock-infected and cultured in parallel. For visualization of mycobacteria-macrophage binding, green fluorescent protein (GFP)-tagged mycobacteria (28) were added to macrophage monolayers for indicated times and evaluated by confocal microscopy. Macrophages from five different donors were infected or not with M. avium, and cells and supernatants were harvested at indicated times from 2 h to 7 days after infection. In additional cultures, 0.5–50 μg/ml MAg prepared from a M. avium lysate (4) or 0.1–10 μg/ml M. avium LAM (29) was added for 2 h at 37°C. After incubation with MAg or LAM, cells were washed three times with PBS, and fresh complete medium with 10% FCS was added before culture for the indicated times. Total cellular RNA was extracted from adherent control or infected macrophages using the Qiagen RNeasy minikit (Chatsworth, CA) (4). The Atlas cDNA Expression Array (Clontech Human Array 1.2I, catalog no. 7850-1; Clontech Laboratories, Palo Alto, CA; complete 1200 gene list at http://atlasinfo.clontech.com) was performed using 5 μg of DNase-digested total RNA. The RNA was converted into first-strand cDNA, labeled with [32P]dATP, and purified by column chromatography (NucleoSpin Extraction Spin Column; Clontech Laboratories). The labeled probe was mixed with denaturing solution (1 M NaOH, 10 mM EDTA) for 20 min, then C0t-1 DNA and neutralizing solution (1 M NaH2PO4, pH 7.0) were added for 10 min at 68°C. The nylon membranes were hybridized in a solution of Express Hyb (Clontech Laboratories) and sheared salmon testes DNA for 30 min at 68°C. The probe was added to the membrane and hybridized overnight at 68°C. The membranes were then washed, exposed to phosphor screens, and analyzed with a PhosphorImager (Molecular Dynamics, Sunnyvale, CA). Arrays were analyzed using AtlasImage 1.01a software (Clontech Laboratories). From each donor, macrophage cultures were mock-infected and incubated in parallel with the cells exposed to M. avium and harvested at the same time intervals. The gene expression in infected cells was then compared with the corresponding control population from the same donor expressed as a ratio (fold change) after normalization to housekeeping genes. Total cellular RNA was extracted using the RNeasy minikit (Qiagen) from 6 × 106 control or treated macrophages per well in a six-well plate. Total RNA (3 μg) was used with the hCK-2 template of the Riboquant MultiProbe RPA system (BD PharMingen, San Diego, CA). Band densities were normalized to the GAPDH housekeeping gene using ImageQuant (Molecular Dynamics). The supernatants from the M. avium-infected LAM- or MAg-stimulated macrophages were analyzed for TNF-α production by ELISA (R&D Systems, Minneapolis, MN). In immunocompromised hosts, M. avium invades the intestinal mucosa and is initially taken up by macrophages in the lamina propria (Fig. 1⇓A), from where it can disseminate to lymph nodes (Fig. 1⇓B) and other tissues. Enormous numbers of acid fast, deep red-stained mycobacteria can be readily identified within tissue macrophages. 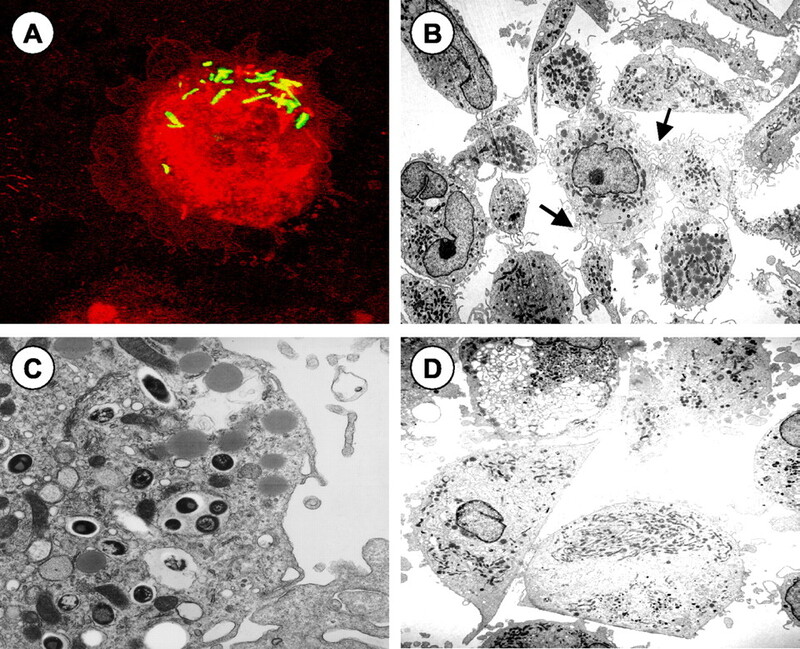 Once inside macrophages, many, but not all mycobacteria survive and replicate within phagocytic vacuoles (Fig. 1⇓C) to eventually be released to reinfect a new macrophage host. As evident, large numbers of macrophages accumulate at these sites of infection (Fig. 1⇓, A and B), largely due to induction of chemokine synthesis by infected macrophages (30). In the absence of adequate T cells, this cycle of recruitment and infection appears to progress unchecked. M. avium infection of tissue macrophages. A, In immunodeficiency states, M. avium invades mucosa, infects and replicates within macrophages and drives recruitment of monocytes which accumulate in the tissue and provide additional hosts for the mycobacteria. Basic Fuchsin with methylene blue and azure II stain of a semi-thin plastic section of the small intestine of an AIDS patient reveals dramatic numbers of infected macrophages in the mucosa. B, M. avium dissemination to the lymph node in an AIDS patient. Large numbers of infected macrophages are identified by acid-fast staining of mycobacteria in a lymph node paraffin section. C, Electron micrograph of binucleated (N) tissue macrophage with multiple intracellular mycobacteria in phagosomes (arrows) (original magnification ×10,000). To assess the impact of M. avium and its constituents on macrophage phenotype and function, peripheral blood monocytes were cultured as adherent monocyte-derived macrophages and exposed to viable mycobacteria, mycobacterial Ags (MAg), or purified M. avium cell wall glycoprotein, LAM. In these isolated primary macrophage cultures, live M. avium follows a pattern similar to that observed in vivo, entering the cells and in many cases, escaping mycobactericidal actions. Within minutes, mycobacteria adhere to the macrophage surface (Fig. 2⇓A), initiate signal transduction (N. Vázquez, T. Greenwell-Wild, and S. M. Wahl, manuscript in preparation), are internalized, and take up residence. Following infection, the macrophages undergo morphological changes, often assuming an elongated configuration and demonstrating highly interactive membranes (Fig. 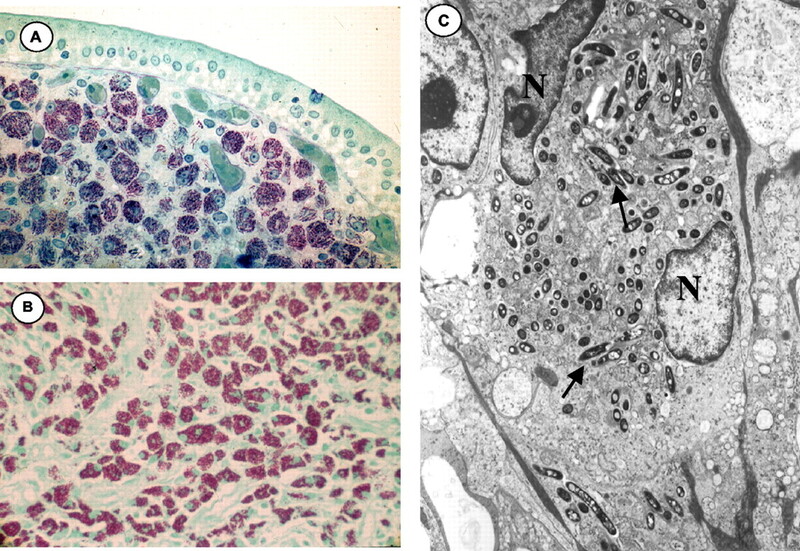 2⇓B), compared with control uninfected cells (Fig. 2⇓D). Mycobacteria are able to replicate in these lymphocyte-depleted macrophage cultures (Fig. 2⇓C), as they do in macrophages in immunodeficient hosts (Fig. 1⇑C). Not only are intact bacteria then released to interact with proximal and/or distant cells but, as some bacteria are killed by the macrophages, released MAg and LAM may activate additional cells. Similar to infected cells, MAg exposed cells appeared activated with interactive cell membranes (not shown) in contrast to control cell populations (Fig. 2⇓D). M. avium infection of macrophages in vitro. A, Exposure of adherent monocyte-derived macrophages to GFP-tagged mycobacteria revealed rapid (5 min) bacteria binding to the cell surface. B, Following infection, the macrophages exhibit morphological changes, including elongation and extensive cell-cell membrane interactions (arrows). C, In 7 day-infected macrophages, replication of mycobacteria occurs in cytoplasmic vacuoles. D, Parallel mock-infected control macrophages. The morphological and structural changes of macrophages early after exposure to M. avium and during the evolution of infection demonstrated a bacterial influence on phenotype and function. To determine the transcriptional impact of the initial interaction between M. avium and macrophages which may underlie mycobacterial persistence, the cells were exposed to M. avium at a ratio of 5:1 for 2 h when RNA was collected and processed for cDNA expression array. Although all isolated monocytes were adhered and differentiated under parallel conditions for 7 days before infection, and individual cultures were synchronously exposed to mycobacteria, heterogeneity in donor macrophage responses to M. avium was noted (not shown). As data from individual donors were reproducible, the heterogeneity, at least in part, stems from the level of constitutive activation/differentiation of the control macrophages from each donor upon which the fold change was based, but may also reflect differential donor susceptibility to the pathogen. We present data (Table I⇓⇓⇓) in which macrophages from five separate donors were infected with M. avium. Only those genes which were reproducibly up-regulated in a minimum of three donors with a mean ≥2.0-fold increase above parallel donor control macrophages are represented in Table I⇓⇓⇓. For assessment of transcriptional suppression, we set our cutoff as a mean decrease of 2-fold in infected compared with uninfected macrophage cultures from the same donor, again in at least three replicate experiments. We selected 2 h after exposure to M. avium as our first time point for evaluation (Table I⇑⇓⇓) to detect genes that might be regulated following initial M. avium-receptor interactions as compared with later time points (1–7 days) which may reflect indirect or intracellular regulation (Table II⇓). Within the first 2 h after exposure to M. avium, many of the differentially expressed genes encoded transcription factors and signal-related molecules, including components of the mitogen-activated protein (MAP) kinase and G protein pathways. Among the most highly up-regulated early response signaling genes were epidermal growth factor (ERBB)-3 receptor protein tyrosine kinase, the guanine nucleotide-binding protein β (GNB) subunit 1, and the rap1 GTPase-GDP dissociation stimulator, as well as kinases, phosphatases, and other signal regulatory molecules (Table I⇑⇓⇓). This heterogeneity in signaling genes may reflect multiple mycobacteria-recognizing receptors (17). In addition, a number of receptors, including IL-2R α and γ components, TNFR1, CD40 ligand receptor, IL-6Rα, the Herpes virus entry protein C, and the transferrin receptor were increased. Associated with enhanced receptors and signaling molecules, transcription-related genes were also increased, particularly those involved in the NF-κB pathway, as well as NF-AT cytoplasmic, activating transcription factor 4, and IFN regulatory factor (IRF)1. Consistent with an effect on NF-κB pathway constituents (4), a dramatic increase in downstream proinflammatory gene expression occurred. With this initial engagement of an apparent host defense response, increased expression of genes for recruitment of immune cell reinforcements, cell-cell interactions, and cell activation were observed (Table I⇑⇑⇑). The striking cell-cell membrane interactions (Fig. 2⇑B) likely reflect M. avium-induced expression of multiple adhesion molecules, as represented by integrins β1, β8, α3, α6, α7, αv, and CD11b and c, in addition to ICAM1 and CD44. In addition to adhesion molecules, up-regulated chemokines (IL-8, macrophage-inflammatory protein (MIP)1β, MIP1α, MIP2α, RANTES) (30) and TGF-β would foster leukocyte recruitment and granuloma formation. Multiple cytokines were also increased early after exposure to M. avium. Although levels of gene expression were variable between monocyte donors (n = 5), IL-1β (average 18-fold) and TNF-α (average 143-fold) were consistently highly elevated within 2 h. Besides IL-1β and TNF-α, the cytokines, B94, LIF, placenta growth factor (PLGF), IL-15 and IL-6, were typically enhanced (Table I⇑⇑⇑), and other cytokines were also modulated by contact with mycobacteria. IL-10 was transiently transcriptionally increased (Table I⇑⇑⇑), but not sustained (Table II⇑). Several apoptosis regulatory genes were also influenced in these M. avium-infected cells (Table I⇑⇑⇑). An increased expression of proteases, particularly matrix metalloproteinases (MMP)7 and MMP11 (stromelysin 3) and cathepsins, was also evident in this early response. Additional genes involved in detoxification and/or associated with bactericidal activity were also modulated in infected cells (Table I⇑⇑⇑). Although numerous genes were enhanced within 2 h after exposure to M. avium, only a single gene (DNase II, an acidic deoxyribonuclease) of nearly 1200 interrogated was reproducibly suppressed within this interval, and many genes were unaffected including iNOS, IL-12p40, and IFN-γ. At later intervals (see below), additional genes were observed to be down-regulated during mycobacterial growth within the macrophages. Following the initial infection and in the absence of T cell activation, M. avium replicates within the cultured macrophages, although some are killed, degraded, and/or released (Figs. 1⇑ and 2⇑). To establish whether bacterial constituents such as MAg or the M. avium LAM stimulated a similar profile of cytokine genes, cultured macrophages were treated with intact microorganisms, MAg or purified LAM for 2–3 h and gene induction was compared with parallel unstimulated cell populations (Fig. 3⇓). With one exception (Rap1), the most highly up-regulated genes in macrophages exposed to live mycobacteria and to purified LAM were identical at 2 h. Both TNF-α and IL-8 were dominant genes, whether triggered by M. avium or LAM. Chemokines and adhesion molecules maximally increased by purified LAM paralleled those induced by viable bacteria interactions with the macrophage. MAg, representing a complex mycobacterial lysate, also enhanced expression of these genes, but in a less defined pattern (Fig. 3⇓). However, by RPA, both LAM and MAg, similar to live mycobacteria, significantly elevated IL-1β in a dose-dependent fashion (Fig. 4⇓, A and C) as determined by densitometric analysis of the blots (Fig. 4⇓, B and D) with smaller increases in IL-1Ra and IL-6. A higher concentration of the crude lysate (MAg) was required compared with the purified glycolipid to induce a comparable response. IL-1α, IL-12p40, and IL-10 were nominally affected in this RPA from a representativedonor within the 2–3 h interval following exposure and no induction of IFN-γ was detected, confirming the array results with viable microorganisms. Gene expression profile for macrophages exposed to viable mycobacteria, MAg and LAM. Adherent macrophages were infected with M. avium (5:1) for 2 h or treated with LAM (10 μg/ml) or MAg (25 μg/ml) and total RNA processed for cDNA expression array. 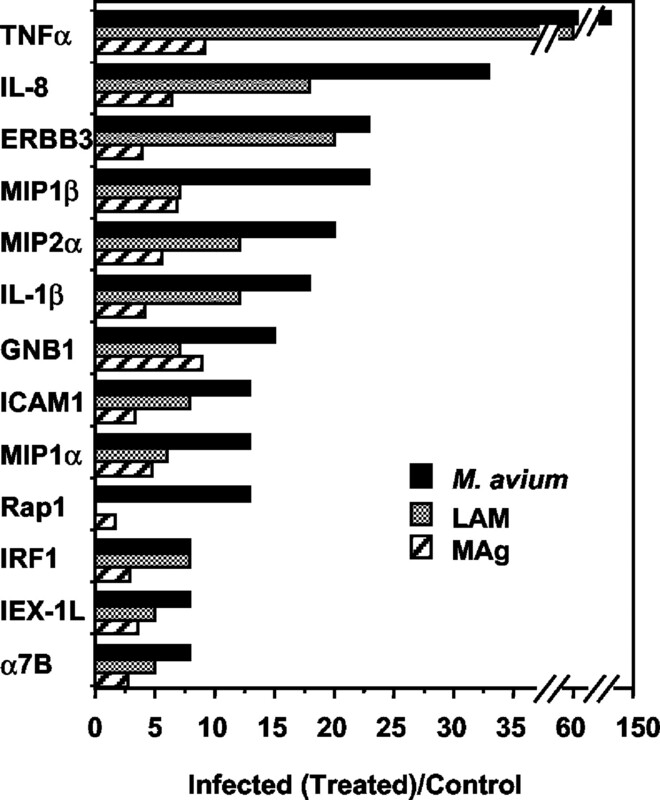 The 13 most highly expressed genes for M. avium-infected and LAM-stimulated cells are shown. Mycobacterial constituents increase cytokine mRNA. A and C, Macrophages treated with M. avium lysate (MAg) or cell wall LAM at indicated concentrations for 3 h exhibit enhanced cytokine gene expression as detected by RPA. B and D, Graphs represent normalization of cytokine genes to GAPDH. To further compare the macrophage response to M. avium, MAg, and LAM, we monitored expression of TNF-α as a representative gene product. Supernatants from M. avium-infected macrophages expressed very high levels of TNF-α protein within hours after exposure to the mycobacteria (4), which declined precipitously, but remained minimally elevated above uninfected controls after infection (Fig. 5⇓A). 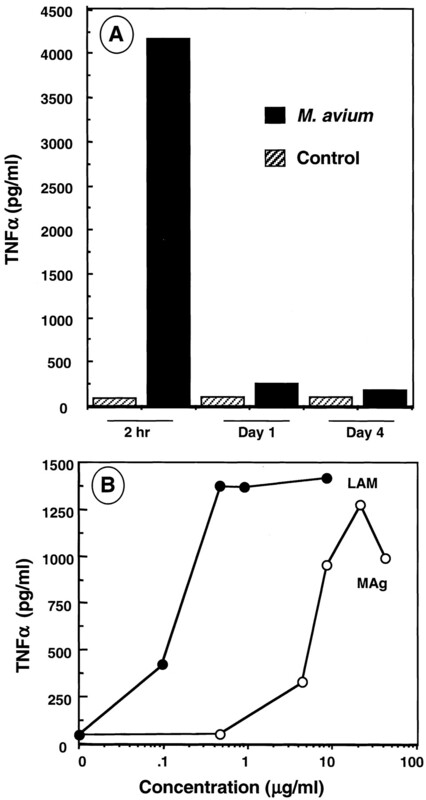 Both LAM and MAg induced a dose-dependent release of TNF-α, although purified LAM was typically a 50–100 times more potent stimulus (Fig. 5⇓B). Thus, M. avium-induced gene regulation in infected macrophages identified by cDNA expression array, as represented by TNF-α, is consistent with and reproducible by RPA (4) and protein assessment (Fig. 5⇓), and may represent a key mycobacterial-induced transient mediator associated with host defense. TNF-α protein expression by infected macrophages. A, Adherent macrophages were infected with M. avium for 2 h to 4 days and TNF-α levels in the supernatants were monitored by ELISA. B, Adherent macrophages were incubated with indicated concentrations of MAg or LAM for 3 h and supernatants were assayed for TNF-α by ELISA. Representative experiment, n = 3. The transient release of TNF-α by macrophages infected with viable microorganisms prompted a kinetic analysis of M. avium-induced genes beyond the initial binding-signal transduction event registered at 2 h. In this regard, we monitored macrophage gene expression 24 h and 4 and 7 days after infection with M. avium as compared with mock-infected parallel cultures from the same donors. The initial macrophage response, which appears to favor signaling and transcription factors, in addition to mediators of recruitment and activation of the cellular components of host defense (Table I⇑⇑⇑), changes strikingly with time. Over the next 7 days, genes associated with inflammation and immunity recede, although some were more stably induced (IL-1β, GNB1, migration inhibitory factor-related protein (MRP)8/14, and MMPs) based on the means of individual donors (Table II⇑, Fig. 6⇓). Moreover, a new spectrum of genes was impacted during days 1–7 postinfection as shown in Table II⇑ (top 20 up-regulated genes are shown for days 1, 4, and 7 postinfection). Signal-related GNB1 and ERBB3, so strikingly up-regulated within 2 h, remained elevated for 4 days after infection (Fig. 6⇓A). IL-8, which increased >30-fold within 2 h, increased further by 24 h and although it declined thereafter, remained elevated during the subsequent week. Monocyte chemoattractant protein (MCP)-1 levels, albeit donor-dependent (30), were elevated from day 1 through 7 (Fig. 6⇓B). The migration inhibitory factor-related S100 proteins or calgranulins, particularly MRP8/calgranulin A, progressively increased through the 7 days evaluated (Fig. 6⇓C). Sustenance of adhesion molecule expression (Fig. 6⇓D) may facilitate formation of multinucleated giant cells. Several of the MMPs rapidly increased and remained elevated after infection with M. avium, while antiproteases, such as tissue inhibitor of MMP (TIMP)1 (Table II⇑), cytoplasmic antiproteinase (CAP)2 and α1 antitrypsin (Fig. 7⇓B) also increased. Notable is a lack of induction of iNOS or defensins at any time point evaluated after infection in this lymphocyte-depleted population. Kinetics of M. avium-modulated macrophage gene expression. Total cellular RNA from adherent macrophages from 2 h to day 7 post infection was interrogated by cDNA expression array for the indicated genes. A, Kinetics of ERBB-3R protein tyrosine kinase and GNB1. B, Expression of the chemokines, IL-8 and MCP-1, from 2 h until 7 days after infection. C, Macrophage inhibitory factor-related proteins 8 (calgranulin A) and 14 (calgranulin B) were increased throughout the 7 days after infection evaluated. 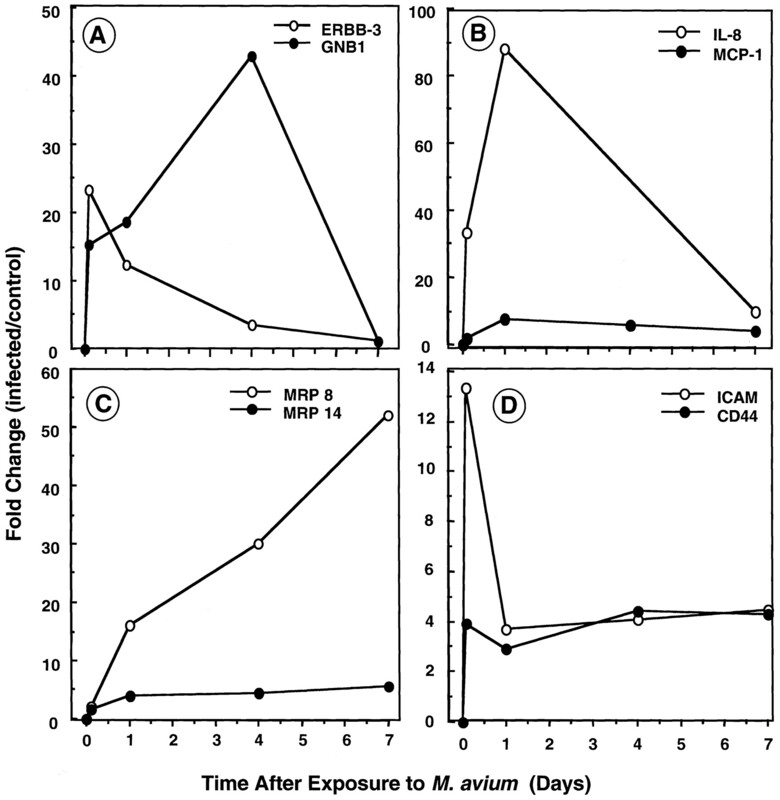 D, ICAM and CD44 were adhesion molecules increased following M. avium infection. Average fold increases compared with mock-infected controls are represented from three to five donors. Kinetics of M. avium-enhanced/suppressed macrophage genes. Total cellular RNA from infected macrophages (2 h to 7 days after infection) was interrogated by cDNA expression array. Data for indicated genes represent average fold increases or decreases in infected compared with mock-infected macrophages from three to five donors. A, MMPs 7, 9, 11, and 14 were increased rapidly and sustained after infection. B, The protease inhibitors α1-antitrypsin and CAP2 were increased 2- to 16-fold above uninfected control cultures. C, Cathepsin D was rapidly increased (2 h) and then decreased along with tripeptidyl peptidase and DNase II. D, The adenosine receptor increased transiently and then was suppressed following M. avium infection. The initial dramatic proinflammatory gene profile appears short-lived. Once the bacteria have been internalized, they apparently no longer transduce signals via surface receptors, and multiply within the cell (Fig. 2⇑, days 4–7 postinfection). At this point, there appears to be a shift to a less inflammatory profile, which may be influenced by IL-10, the levels of which are maximal in the supernatants at 24 h (not shown). Failure to sustain an antimicrobial defense (Figs. 1⇑ and 2⇑C) did not appear to be the consequence of large scale down-modulation of macrophage genes. By 24 h, only CD40R-associated factor 1, caspase 10, adenosine A1 receptor (ADORA), and cathepsin D (Table II⇑, Fig. 7⇑, C and D) were reproducibly decreased >2 fold. Over the next 4 days, the negative transcriptional regulatory impact of M. avium on macrophages remained surprisingly minimal. ADORA, cathepsin D, and caspase 10 remained suppressed, in addition to decreases in nucleoside diphosphate kinase B, ras homolog gene family member A, histidine triad nucleotide-binding protein (protein kinase C (PKC) inhibitor 1), and several other regulatory molecules (Table II⇑). 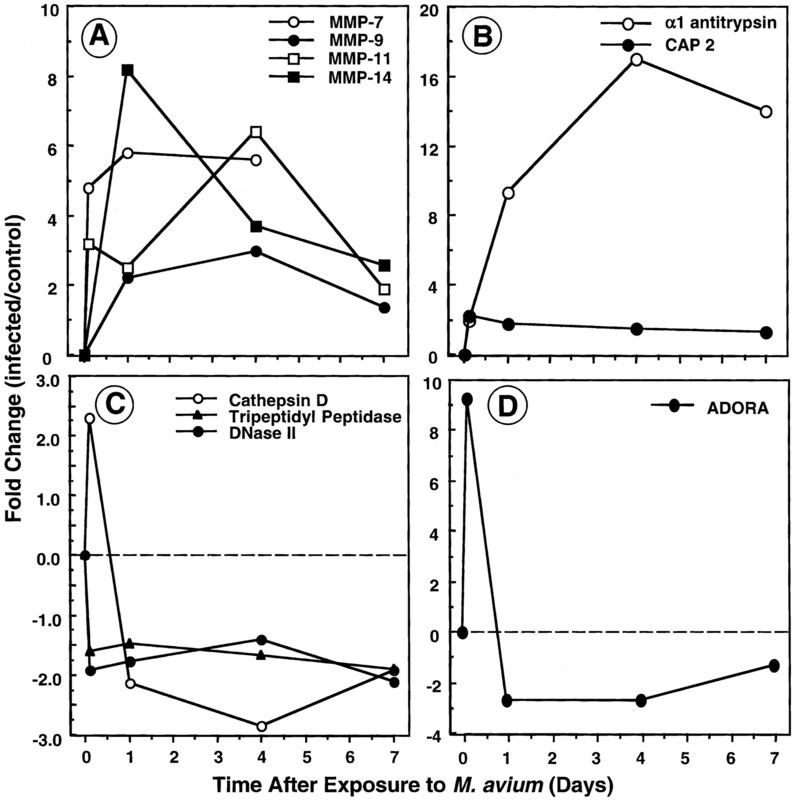 Whether the continued suppression of ADORA, α3, cathepsin D and DNase through day 7 (Fig. 7⇑), as well as additional genes (Table II⇑), influences M. avium activity is unknown. Although additional genes might be down-regulated in individual donors, they were not always reproducibly inhibited in multiple donors. Collectively, the decrease in gene expression from 2 h to 7 days after exposure to M. avium is unimpressive and how, or if, these modulated genes impact on mycobacterial growth and survival remains to be determined. The innate response to mycobacteria is initiated when the microorganisms interact with cell surface pattern receptors, including TLR, to signal and/or become internalized. Recognition occurs largely through the mycobacterial cell wall constituent LAM, and M. avium envelope LAM binds toTLR2 and also may bind to the glycosylphosphatidylinositol-linked protein CD14 (20, 21, 23, 31, 32). 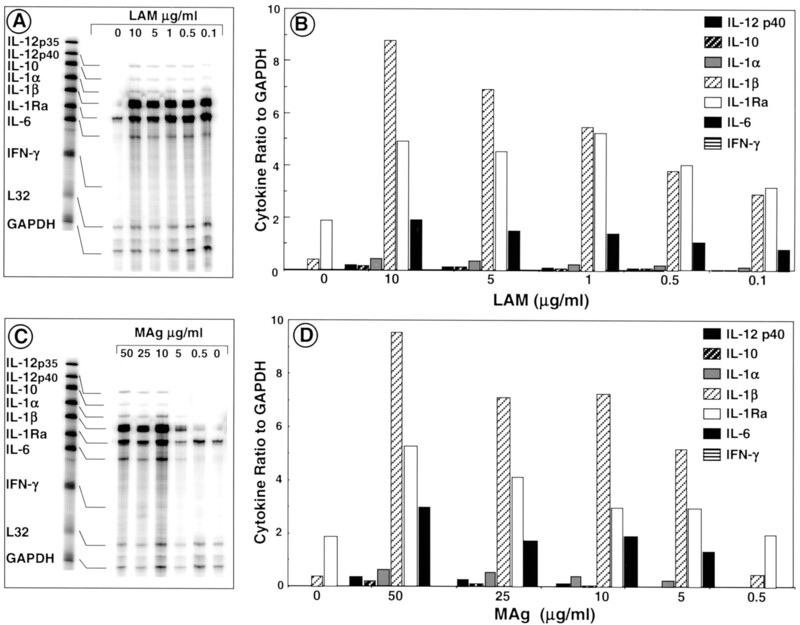 Based on our comparison of gene expression mediated by intact mycobacteria, mycobacterial Ags, and M. avium cell wall LAM, it appears that a shared ligand mediating M. avium-induced intracellular signaling is LAM. Nonetheless, multiple noncongruent genes were represented at lower transcriptional levels between viable mycobacteria and its cell wall constituent (not shown), consistent with the specificity of LAM, the potential engagement of additional receptors by intact bacteria, the transient LAM signal, and persistence of activation by the intact organisms. Whereas the bacteria may bind to the same TLRs as does LAM to orchestrate a shared signaling cascade, the uptake of the bacteria appears to engage additional pathways involving cytoskeleton and signal transduction. Agonist engagement of TLR2 (31) in primary monocyte-derived macrophages triggers a signaling cascade within minutes, including phosphorylation of MAP kinase family members and activation of the transcription factor NF-κB (4, 31, 33, 34) (N. Vázquez, T. Greenwell-Wild, and S. M. Wahl, manuscript in preparation). In our transcriptional analyses, multiple MAP kinase and NF-κB-dependent genes were rapidly and dramatically elevated by 2 h after infection. Up-regulation of Rac1 is consistent with recent reports that this Rho family GTPase is involved in TLR2 signaling (35), as well as cytoskeletal changes (36) and possibly, autocrine IL-6 signaling linked to STAT3 (37). Signal transduction leads to rapid up-regulation of a panoply of chemokine mRNAs and proteins (30), similarly up-regulated by other bacteria (38, 39), and likely effective in mediating leukocyte recruitment and initiation of the adaptive immune response. The rapidity with which some of these chemokines are released (30) and their known interactions with cognate seven transmembrane domain G protein-coupled receptors suggests the possibility that the increased gene expression of G protein-associated signaling molecules might be a secondary consequence of engagement of this pathway. Also evident is the persistence of these molecules, particularly IL-8, a week after infection, which is consonant with granulomagenic congregation of inflammatory cells, essential as new bacterial hosts (30). Beyond recruitment of leukocytes, chemokines, in recent times, have been shown to have multiple additional activities in angiogenesis, matrix deposition, and proliferation (reviewed in Ref. 40). Pathogenicity may also be fostered via enhanced transcription of adhesion molecules to facilitate migration through the endothelial barrier to the site of infection, promote cell-cell interactions, and formation of multinucleated giant cells (4, 5, 41, 42, 43). The regulation of macrophage trafficking may also be a function of elevated MRP8 and MRP14. The production of these myeloid S100 calcium-binding proteins has been associated with fast migrating cells that express high CD11b and preferentially use ICAM-1-dependent mechanisms of transendothelial migration (44, 45). Recruitment and activation of inflammatory cells at the site of infection would not only involve the orchestrated expression of leukocyte and vascular adhesion molecules, and the generation of chemotactic gradients, but also the production of multiple MMPs, essential to dissolution of basement membrane and matrix components. Along with M. avium-mediated NF-κB activation (4) and abundant gene expression of TNF-α and IL-1β, an extensive repertoire of cytokines and other mediators transiently escalate subsequent to infection. Early, but unsustained increases in IL-10 and TGF-β may share in dampening the initial activation response (46, 47). TNF-α and IL-1β, proinflammatory cytokines that activate multiple signal transduction pathways to influence both immune and nonimmune cell function, also inhibit macrophage apoptosis (48). This is in keeping with the observations that infection with M. avium appears to protect macrophages from apoptosis, thereby maintaining the pool of infected and infectible targets (5, 6, 30). Avirulent mycobacteria reportedly more effectively promote macrophage apoptosis than virulent strains (49), consistent with our observations that phagocytic uptake and internalization of M. avium induced expression of apoptosis regulatory genes. The enhanced expression of immediate early gene X (IEX)-1L, Bcl-2A1, and Bcl-x may counteract apoptotic protease-activating factor 1 and Bax with the balance of pro- and antiapoptotic pathways favoring survival. During the 7-day postinfection interval monitored, morphologic integrity and function appeared uncompromised, and apoptosis was not frequently encountered (assessed by TUNEL staining; H. Hale-Donze, unpublished observation) in these infected monocyte-derived macrophages, consistent with the mycobacterial need for prolonging the functional longevity of their hosts. The meek IL-12 response observed in this study does not conjure up an image of a robust Th1 response considered essential to eliminate the mycobacteria (50). IL-12 is reportedly a key cytokine in host defense against mycobacteria (51) and the absence of IL-12 increases infectibility in animals and humans (39, 52, 53). TLR2 signaling in murine macrophages was also recently shown to not induce IL-12p40, IFN-γ, or IL-6 mRNA compared with a TLR4 agonist (54). And in fact, the initial M. avium signaling response and generation of inflammatory mediators by macrophages is transient, suggesting that once internalization occurs, the mycobacteria suppress the response which allows them to establish an infectious niche before recognition by the adaptive immune response. The virulence of strains of M. tuberculosis is considered inversely proportional to its efficacy in inducing proinflammatory cytokines (55) such as TNF-α, and the massive induction of TNF-α by M. avium and LAM could fit this pattern in an immune competent host. Further insight into the mechanisms of mycobacterial subversion may be found in the suppression of certain macrophage genes by the pathogen. In the second phase, when many of the initially enhanced genes have returned to control levels, evidence of microbicidally relevant genes implies an attempt to limit growth of ingested mycobacteria, but macrophages continue to harbor the M. avium. M. avium is transported to phagosomes, which in the absence of IFN-γ-mediated activation (31), do not fuse with protease-bearing lysosomes, enabling mycobacterial survival. Although lysosomal cathepsins D and L transcripts are initially increased, mycobacteria suppress those lysosomal enzymes which may otherwise contribute to their demise. Cathepsin D, an acidic protease up-regulated within hours in response to M. avium, is synthesized as an inactive 51-kDa proform and typically processed to a 30-kDa mature form in acidic lysosomal compartments (56). However, viable M. avium-harboring phagosomes, with retarded acidification, do not process procathepsin D (56, 57), blocking its proteolytic potential. M. avium inhibition of cathepsin D activity plus suppression of its transcription, together with enhanced expression of α1 antitrypsin, may contribute to mycobacterial escape from degradation. In contrast, MMP7 (matrilysin), MMP11, MMP14, and MMP9, which increase early, remain variably elevated through 7 days after infection. MMP9 has previously been shown to be up-regulated in M. avium-infected PBMC and to facilitate HIV-1 replication (58). At least at the transcriptional level, the corresponding modest increase in TIMPs may implicate a proteolytic imbalance. Whether persistence of MMPs subserves some mycobacterial need, in addition to facilitating recruitment, cytokine processing, and granuloma formation (58, 59), is under evaluation. Increased virulence may also be associated with increased gene expression of the transferrin receptor for requisite iron transport (60), and transient increases in the free radical scavenging enzyme superoxide dismutase (2 h) may represent a potential mode of macrophage self-preservation, but also protect the mycobacteria. Decreased ADORAs, which reportedly regulate TNF-α and IL-6 (61) and suppress IL-12 production (62), could also support a less hostile environment. It is conceivable that the mycobacteria may incorporate multiple cellular mechanisms for their survival, enabling replication within a safe haven and eventual release by apoptotic or necrotic macrophages to begin the reinfection process. Depending on whether pro- or anti-inflammatory-driven responses prevail, the mycobacteria will be cleared or protective granuloma will evolve. Evidence for increased platelet-derived growth factor (PDGF), observed early after infection and elevated again after a week may be contributory to fibrogenesis. Whereas M. tuberculosis infects individuals with apparently normal immune function, M. avium is an opportunistic pathogen. Our findings with M. avium may provide insight into unique and/or shared inducible host factors involved in the differential virulence between M. avium and M. tuberculosis. Comparing our data for 1200 potential M. avium-regulated genes in primary macrophages with that for 375 immunoregulatory genes evaluated for M. tuberculosis in a cell line (63) and in macrophages (39) revealed not only considerable overlap, but also differences at early time points. Our study also uniquely monitors gene expression at later time points consonant with mycobacterial survival and intracellular growth. Moreover, analysis of M. tuberculosis-induced changes in gene expression in murine macrophages (64) revealed both shared and unique transcriptional pathways. Comparison of M. avium- and M. tuberculosis-induced gene expression in parallel macrophage cultures will provide important insight into virulence-related genes. In addition to host factors, environmental factors and bacterial genotype and phenotype all influence the outcome of infection and evolution of disease. These M. avium opportunists, to which many individuals are exposed, but which typically cause no symptoms or pathology as they are rapidly cleared, can become life-threatening in the context of HIV-1 infection or by other modes of immune suppression (3, 4, 5). Engagement of adaptive immunity and T cell function is essential to bacterial containment (65). The requisite IFN-γ signal is deficient in HIV-1-induced immunodeficiency as well as in our purified macrophage cultures. Whether due to a lack of IFN-γ or an inability to respond to IFN-γ, as occurs in macrophages infected with virulent M. tuberculosis (66), the microorganisms have a survival advantage. Unraveling the intricacies of M. avium entry and intracellular cohabitation with macrophages provides new insights into disarming mycobacterial invasion and evasion of host defense. We thank Dr. Jamie Foster, National Institute of Dental and Craniofacial Research, for assistance with confocal microscopy. We thank Dr. Robert Palmer, National Institute of Dental and Craniofacial Research, and Dr. S. Dhandayuthapani, Department of Microbiology, University of Texas Health Science Center, San Antonio, TX for GFP-tagged mycobacteria and Nina Schneider, National Institute of Dental and Craniofacial Research, for manuscript preparation. ↵2 Abbreviations used in this paper: MAC, M. avium complex; TLR, Toll-like receptor; iNOS, inducible NO synthase; MAg, M. avium Ag; LAM, lipoarabinomannan; GFP, green fluorescent protein; RPA, ribonuclease protection assay; MAP, mitogen-activated protein; GNB, guanine nucleotide-binding protein; IRF, IFN regulatory factor; MIP, macrophage-inflammatory protein; PLGF, placenta growth factor; MMP, matrix metalloproteinase; MRP, migration inhibitory factor-related protein; MCP, monocyte chemoattractant protein; TIMP, tissue inhibitor of MMP; CAP, cytoplasmic antiproteinase; ADORA, adenosine A1 receptor; PKC, protein kinase C; PDGF, platelet-derived growth factor; PP, protein phosphatase; ITG, integrin; HSP, heat shock protein; GST, glutathione S-transferase; ERBB, epidermal growth factor; IEX, immediate early gene X.